Major Nick Visconte was the company commander of India company. He took over from Major Steve Lawson, the commander of Lima company, for Firm Base 1 in the city of Hit. Two better men would be harder to find. Steve was there for the initial invasion of that city, and Nick took over shortly after. We were glad to have India company back with us, they were detached to the air wing guarding the air station our entire time overseas until then. Nick proved to be the right man for the job of dealing with the Iraqis in Hit. The Marines have two main schools of thought on how to win over the locals to the idea of supporting us. One is to go through existing power wielders, the other is to appeal directly to the people. There is no one method that always works, sometimes one works where the other won't, but each officer tends to have his own trend. Each method has strengths and drawbacks, and you can say that the history of the counter-insurgency in Iraq has seen the US see saw back and forth. We disbanded the Iraqi army and all of its government, yet we let engineers continue running infrastructure like dams and refineries. We brought back Iraqi army units in the first battle of Fallujah only to disband them almost immediately. This same see sawing occured at lower levels too. Here's a story of what happened with my battalion in the city of Hit. When we set up a permanent presence in that city, we shocked the city leaders. The city had been totally controlled by the enemy, and not so much by foreign elements as by former regime elements and local strongmen. This was a critical phase of the non-kinetic battle, where Information Operations and Civil Affairs are most important. Civil Affairs deals with the well-being of the locals, they're the softies that build schools and make water treatment system repairs, and they get a lot of press. Information Operations is often confused with them, but it's not a group as much as it's a way of thinking and acting. Information Operations is a euphemism for Propaganda Activity. It's the attempt to influence the indigenous people to be on our side. Sadly, IO is not a very well developed concept yet. Oh, you can attend lots of classes on the topic where people from various puzzle palaces will tell you how important it is to provide all your people and assets to IO. Mostly that is simply empire building from on high. After three hours of such classes before we deployed I asked the following question: "You've shown us examples of how the enemy uses IO against us, and you've shown how we can use IO at a national level, but can you give me an example of how we can use IO at the battalion level." I expected a quick and ready answer. Instead I had to repeat the question, without an answer, so many times that I was finally asked to let someone else ask a question. They could not cite a single example of how IO is to be used at the battalion level, and didn't seem to regard this as unexpected. So, in empire building for a task that is poorly defined, you can expect a lot of in-fighting and some less than stellar people being assigned the job. The city leaders in Hit took advantage of us at every opportunity that they could. Like all Iraqis they denied that any insurgents had ever been in the city. Finally, we invited them over to a site, without explaining why, and took pictures of them standing in front of recently discovered weapons caches. They stopped denying that insurgents were in the area only after having proof like that. They wouldn't admit insurgent activity even if they were shown the weapons cache, only having them in a picture with it were they finally able to admit it. Our Civil Affairs officer had set up a system where we give the city leaders money to pay to those whose property was damaged. This was an attempt to recognize them as leaders and bolster their standing in the community. It's the nature of military operations that things break. Marines are not gentle people. When we drive our tanks down the street, the water pipes are buried too shallow and tend to break. Gates and doors are broken. But we always pay for damage done, it's important to us. The theory was that they would appreciate this and support us, or at least this is what the IO officer seemed to think would be the case. But it didn't work. Here's where my hero of the day, Nick Visconte comes in. Nick understands people. He understands strongmen. He likes to imply that his family "knows" mafia members in the US and this helps him understand Iraqis. On his last trip to Iraq the locals made him a sheik of their tribe, he has all the paperwork to go with it. He is the tribe's sheik for the New York region! One day Nick decided to go to the city plaza and make restitution to the people directly. One effect was that we now knew as a fact that injured parties were compensated the full amount. The other effect was more dramatic and much more important. Before the city leaders were quite haughty and disdainful of us. They had power and felt secure in their power. But this one act of going around them and directly to the people suddenly made them aware that they were not as all powerful as they pretended -- and we knew it. The farce of tribal power was brought right out into the open. At the next meeting with the city leaders, amazingly all the city leaders showed up and were very attentive. They didn't like losing power and would do everything to convince us not to take it away again. This one small act did more to win over both the people and the leaders than anything else we did. And will disregard the rest. Congressman John Murtha has been in the news a lot recently, mostly bad mouthing the military and saying how hopeless it is for us. I have no idea where he got that idea from. 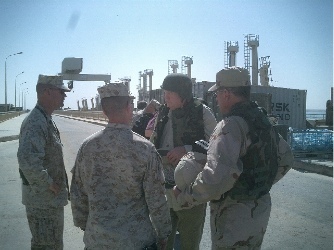 When he came to visit our battalion in Haditha Dam, Al Anbar Province, Iraq, we told him an entirely different story. This is a picture of him with some army guy I don't know, our battalion commander and the battalion sergeant major. There's no telling what our CO told Rep. Murtha. But I am pretty sure he didn't tell him that we need to cut and run. We had a dog and pony show with samples of how much our equipment had improved in the short time we had been there, especially regarding armored vehicles. I'm sure he bragged at our recent permanent presence in the city of Hit. And I'm pretty sure no one told him that we needed to be pulled back home before finishing the job we were doing. But a man will hear what he wants to hear. See what he wants to see. And make any kind of crazy claim to support his political agenda. His aides walked about handing out little keychain fobs with his name on them. I didn't keep it, wish I had now, so that I could mail it back to him with appropriate comments of disapproval. He and the other congressman, who's name I don't remember because I didn't get a key chain fob with a name on it, had some really hot-looking aides with them. It caused a small stir when they came to the top of the dam. 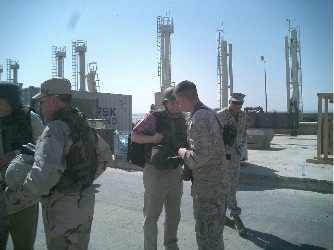 Here LCpl Fencil, our photographer, seems to be chatting with him, but I suspect he was really checking out his aides. I was too discreet to take pictures of them. Rep. Murtha retired as a Marine officer. It's a pity he didn't seem to learn much about warfare from that experience. But a man's agenda will influence what he sees and hears first hand. Or at least what he'll say he sees and hears.